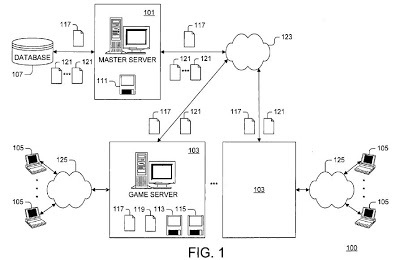 The ‘903 patent describes a system which observes players playing online for any signs of cheating. For anyone who has played Halo online and been a victim of the “laggers,” this invention couldn’t come soon enough. While the players play their game, their data is sent to a separate server which analyzes the data for any signs of cheating. All of the servers which run the game are linked together and share information—this helps prevent cheaters from jumping from server-to-server and never getting caught. Whenever a player is caught cheating on a certain server, the player will be banned from that server. While he can still play on the other servers, he will never be allowed back on the server he has been banned from; this effectively prevents him from continuous cheating without being punished. Technology is provided for preventing cheating during online gaming, including a first online gaming server computer system configured to gather information regarding cheaters detected during online gaming; a second online gaming server computer system configured to receive the information; and a central database configured for aggregating the received information regarding cheaters detected during online gaming gathered by the first online gaming server computer system along with information stored on the central database regarding cheaters detected during online gaming gathered from a plurality of online gaming server computer systems. The aggregated information from the central database regarding cheaters detected is made available to the second online gaming server computer system, and cheaters identified in the aggregated information are prevented from online gaming on the second online gaming server computer system based on the aggregated information from the central database. 1. A system for preventing cheating during online gaming, the system comprising: a first online gaming server computer system configured to gather information regarding cheaters detected during online gaming; a second online gaming server computer system configured to receive the information regarding cheaters detected during online gaming gathered by the first online gaming server computer system; and a central database configured to aggregate the received information regarding cheaters detected during online gaming gathered by the first online gaming server computer system along with information stored on the central database regarding cheaters detected during online gaming gathered from a plurality of online gaming server computer systems, wherein the aggregated information from the central database regarding cheaters detected during online gaming is made available to the second online gaming server computer system, whereby cheaters identified in the aggregated information from the central database are prevented from online gaming on the second online gaming server computer system based on the aggregated information from the central database.